lSOLDove it when I have a lot to say about my inspiration for a new painting. I grew up in a large creative family of 6 girls and one boy. Two of my older sisters left home as soon as they turned 18 to become “actresses”. My parents weren’t too happy. I can remember going to many of their plays from Macbeth to West Side Story. Mostly community theater but to an 8 year old it seemed like Broadway. Another sister, my oldest, who didn’t take off to find the footlights, actually looked just like Barbara Streisand. Naturally we were huge Streisand fans. 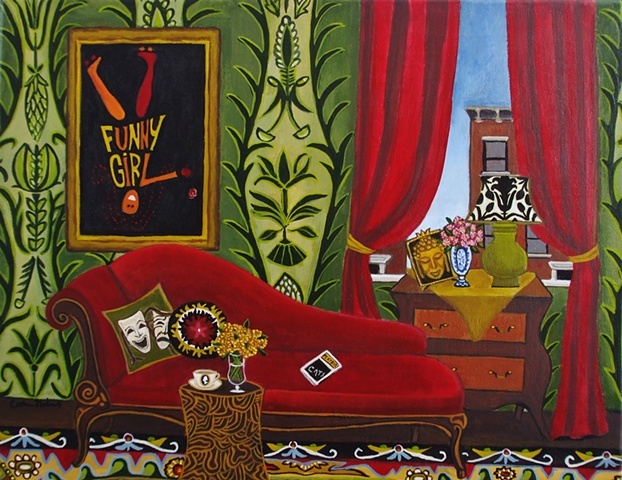 I have a great memory of going to see Funny Girl with her in the most beautiful movie theater in New York, red velvet curtains and chandeliers galore. I was an instant fan at 10 years old.